Our mission is to save you time and money by offering the best solution to solve your water problem. 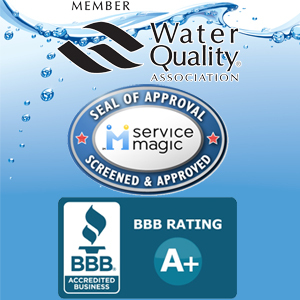 Your water symptoms will be diagnosed precisely by our WQA certified staff and we send factory-trained and certified technicians to install your equipment. As a family-owned business, we take extra care to see that you are satisfied and recommend us to your friends and family! Russ loves working with his family and is committed to delivering the best customer service possible. In his spare time, he likes to spend time with his wife, Sherry, and goldendoodle dog, Biscuit. He also enjoys reading, writing poetry and whitewater canoeing. Cindy has a passion for helping people solve their water problems. Her hobbies include jewelry design, gardening, entertaining friends with her husband, Chad, and playing with her two dogs, Ilsa and Libby. Eva loves to show families how it pays to improve their water, and why it costs too much not to. She has lived in Chicago, New Orleans, Berlin and now resides in Belvidere with her two Weimaraners. She enjoys cooking, remodeling her home and is a member of the local German Society.